here, in Dongguan, the most industrial city in the world, where the common phrase is "Dongguan is the factory of China and China is the factory of the world", well, I found a forest ... with a network of forest trails ..
Just 3km from my new home, I left some industrial area at my back and found a small artificial lake with a small road around it. To my extreme surprise, the road soon departed from the lake and become unpaved, and got deeper into a "forest" of tropical trees. as usual, yesterday evening I go my daily sms from China Mobile with the weather forecast for today ... I sounded like (my translation from chinese...) : "Summer has arrived; the temperature will be very high, with clear skies. Temperature from 26 to 34C, Humidity from 70% to 90% ....."
So this morning I hit the road at 6am, but it was already a 26C, with 95%Rh ... I slogged an easy 10k. Weekly balance: 84k (not bad and ahead of target), Unfortunately I sucked at the long run, otherwise 2 decent quality workout (quick farltek 10x1' + 10x30" and a MP run of 8k). For sure I need more rest (usually I do not sleep more than 6 hours). DNF a training run ?? During the week, I was able to gather some of the best runners in HK for a solid long run on this Saturday. Well, basically "my legs did not show up"
a wonderful treadmill Technogym Runrace (made in Italy), that has just landed in my new apartment. It seems that it was originally installed in the Club House of an exclusive private club in Hong Kong. Later was owned by a friend of mine who changed job and was in need to get rid of it. It is a professional model, 250kg of weight !!!. To fit it into that room, 8 people were needed to carry it on the stairs , plus partial disassembly to get into the door. unfortunately in Dongguan, either you run outside at 6am, either the traffic is too much until late in the evening, so indoor running is the only option in the evening. - weight loss : 1,4Kg !!.... (keeping into account also a bottle of water drunk during workout). Skipped 2 days for work/family issues, but achieved anyway the target (slightly under 70km for the week). The rain is falling for days and days. There are periods of clear skies, but sooner or later black clouds bring torrential downpours that last for hours. This morning I set the alarm clock at 5.00am and planned a long run. Actually I did sleep too little and very poorly, so I was really not motivated by the ring of the alarm clock. Dragging out of bed, I eventually set out from home at 5.30am and decided to hit the streets of the town centre rather than always looping around the same industrial estate. Well, very pleasant surprise: at that time, the roads were completely quiet and actually this town were I live now is quite pleasant for running. There are large boulevards lined with factories inside the town center itself and there are no sign of heavy traffic, trucks like it was in my previous place. That town (the old one) was at a cross-road of important national roads and the local administration did not care about building some outer ring or drive through road. So all the traffic (trucks 24/7...) was obliged to pass in the town center and it has alwasy been a nightmare for me to find some quiet route. So for 3 years I had to stick to the same loop. Overall I did 22km, without "looping" ... not bad. I even found a nice country road heading to a dam that deserves further exploration. total 22km in 1h37' (not bad being my first long run in 3 months). All workout at steady pace (or better ... for the heat, the pace progressively fading, while the effort progressively rising...). at least, it is good for running because the rain really chills down the body. ==> total fluid loss: 1,6kg/3,5 pounds (in 1 hour!!!) : 2,1% of body weight ..
for a long run I would need to carry not a bottle but a tank of water. This is my personal tribute to the street where I was "born again" as runner. In the fall of 2006 I was really underperforming and not improving. Somehow I understood my mistakes, changed my training habits and also did venture outside to find a quieter street to run. I started to run back and forth on the same street for a month every morning, forcing to win myself out of bed and run in a dark street (no street lightening...). 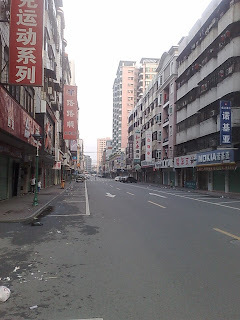 (photo taken at 5.30am ... that's why is so quiet... after 7.00am it is so trafficked that you would not even dare to cross the road). 1) I set it as the start of the new running season 2008/2009. Reset all the mile counter and now planning what to do in the new year. Because of the summer heat, basically running life goes to "hybernation" (hahaha... the right word) until September. Now I have 3 months of only training to go back to the fitness before the injury. I plan to run a Marathon in November/December targeting 2h35'. 2) I moved. After 4 years in my flat in one district of Dongguan, I decided that it was better to move closer to the factory to avoid the daily commute in the ever increasing traffic + perennial opening of new road contruction projects (in 20 years, China will be covered by highway... but now we are paying the price under the form of building sites everywhere). The new flat is just 5 minutes drive from work, it is bigger and in a quieter area, so I guess it could be a better choice for running. 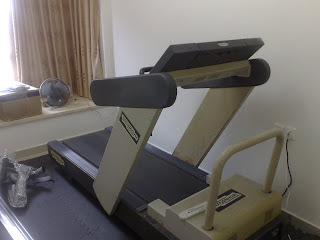 Thanks to a friend who want to dismiss his treadmill, I will also set up my own treadmill in one of the bedrooms !!! (picture later). Something that I always hated of that town: it was maybe one of the dirtiest town in Dongguan. Many night food stalls and everyone is just throwing the stuff on the floor. In the morning, it is really smelling bad .